The D3 is not as intuitive as TC Electronic's Ditto, but those dual loops could seal the deal. Not the most intuitive option out there. The Duet is not the only micro stereo looper, but it's said to be the first in its size class that allows series recording and playback of two loops. There are two modes, which are selectable by a toggle switch: Undo/Redo mode supports one five-minute loop with overdubs that you can undo or redo, while Verse/Chorus mode allows two separate loops of up to five minutes each thatcan be recorded, overdubbed, or played separately. Operation is down to how you hit the footswitch - a tap, double tap and a long press all have different functions and you can see where you are via two LEDs that can each light up red, purple or blue and can be solid, flashing or pulsing. That might sound complicated on paper, but in practice, it doesn't take long to get up to speed. 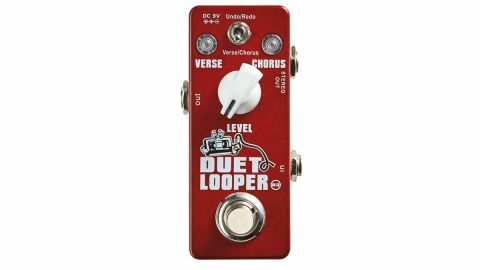 The result here is a handy little looper that's great for laying down chord sequences to play over - or even for storing two different loops that you can switch between.